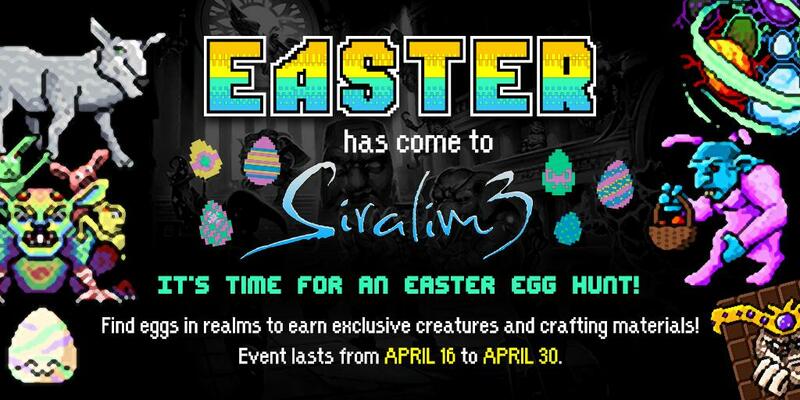 Announcements / Siralim 3 is now available for PS4 in the North American region! - ADD: Mimics now have a unique sound effect when they attack. - FIX: Crash related to the "Living Axe" spell. - FIX: Some damage-boosting traits didn't activate sometimes. - FIX: "Parasites" spell treated the Leech buff as a debuff. - FIX: Crash during holiday events. Announcements / Siralim 3 was inaccessible for the last few hours due to a crash. As you all probably noticed, Siralim 3 was inaccessible for the last few hours due to a crash. Your save files are not corrupted or anything like that - instead, an event activated recently that caused the game to crash on startup. This event has now been disabled server-side until I can patch the game and fix it. You should now be able to play the game as intended. The event was supposed to unlock a wardrobe costume and title, but something went wrong this time. I'll move the date up and re-enable it after all platforms are patched. I'm very sorry that you weren't able to access the game for the last several hours - this is definitely a worst case scenario for me and I will take measures to ensure that it doesn't happen again. Announcements / Forum Avatars have been updated! - Fixed a crash that occurred after killing the Treasure Golem. - Fixed some display issues in certain realms. Page created in 0.194 seconds with 58 queries.